I ate them they were nice. What exactly is “drinking chocolate”? Is it the kind of cocoa powder you put into milk to make chocolate milk? Also, I’m guessing that putting everything into grams is similar to it’s volume in a cup measure (eg: 250 g flour = 1 cup flour). I myself am not a big baker, but the recipe does look tempting. Drinking chocolate is just cocoa powder. I’ve had a few people ask me that – I think I’ll change the recipe to save confusion. I do use the Metric system (Canadian and all), I’m just not used to seeing metric measures as grams/weight instead of cups/volume. I have tried this recipe and it’s great. Kids love them there is only one problem you have to make lots of them as the children and adults keep coming back for more. Drinking chocolate is sweet and it is nicer than cocoa. I also use the drinking chocolate to dust my chocolate buns when i ice them just to give them a rich look. I loved your recipe for chocolate muffins.Most recipies that I have seen uses cups as a form of measurement.I’m not too sure how big or small the cup should be! very reluctant to share them with anyone! September fool. Yeah I’m talkin 2 u, drinking chocolate is not like coco powder ok.
My son wrote the comment above. I didn’t expect him to be so ascerbic. I have to to agree with him though. Cocoa powder and drinking chocolate are completely different from each other. Both are delicious in their own way. i liked the easy recipe and used low fat milk and butter to be able to make them more often. first recipe i found that didnt include oil. perfect for kids to bake and eat!!!!!!!! these muffins rule best muffins ever always in the mood!!! all in all GREAT muffins and thats coming from Muffin Man! I tasted them on 7 th aug and I thought they were the best ones i`ve ever tasted + normaly im not a fan about muffins but i thought they were the BEST and mark my words! THERE THE BEST! thanx for helping me with my homework!!!!!!!!! Omggggg TYYYTYTYTYTTY PS: i LOVe the Muffins me and my family made it thnxx alot!!! This sounds crazy good, I will have to give it a try. I soo want to make them now! I made them today. They were a bit dry but tasty. Hi if i would want to make maybe half the amount of the muffins do i divide half of the amount for the ingredients? as 20 muffins is way too much for my family. 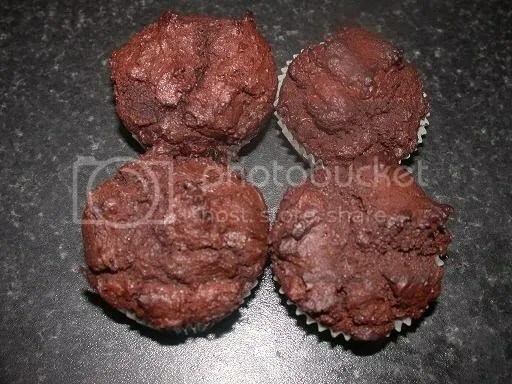 You are right its not easy to find a recipe for chocolate muffins – so thank you for finding this one.